Growing garlic in the garden is an excellent way of providing your kitchen with one the freshest, and most flavoursome of herbs, especially if you are a little short of space in the garden. 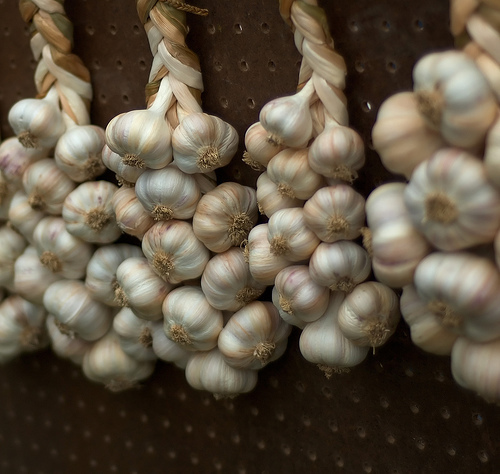 Not only is garlic simple to grow, it has also been used throughout history for its medicinal value too. However, the key to keeping garlic through the following months is entirely down to harvesting them at just the right time and then drying them off properly so that they are not prone to rots which will quickly ruin your precious crop. 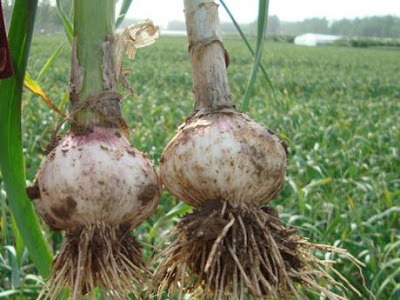 Your garlic should be ready for harvesting any time between August to September depending on both the weather and individual varieties. The problem with harvesting garlic is knowing when they are ripe in order to lift them. With their cousin the onion, it is a simple affair. You can simply let the tops bend over and die down where they are and you can delaying lifting until a time that is convenient for you. If you're in a rush, you can move things along by bending over the foliage yourself ! With garlic, though, waiting until all the leaves go brown will promote overripe bulbs whose cloves are starting to separate from one another, and the resulting loose heads won't store as long. Each leaf that turns brown is one fewer potential wrapper to protect the bulb. Harvest them too early and the bulbs will be too small, but harvest too late and the bulbs will begin to loose their quality, and so a more accurate method is needed to determine whether or not the garlic is ready to harvested. Old hands say that it's time to harvest when several of the lower leaves go brown, but five or six up top are still green (and depending on the weather). The problem is that this can occur as early as the end of July - far too soon. I would suggest this. If the weather is wet in early August, pull up a single bulb and see how many sheaths (the thin papery layers that surround the bulb) you can peel off the bulb, if the answer is three then the bulb is ready to be lifted. If you can remove four or more layers then it is best to wait another couple of weeks or at least until most of the leaves have turned brown. When harvesting garlic bulbs, gently ease them out of the ground using a trowel to loosen the surrounding soil, taking care not to bruise them as they will then not keep for long. To begin with, you will need to brush off any soil clinging to the bulbs, just be careful not to expose any of the cloves. Then allow the bulbs to cure for three to four weeks in either a well-ventilated room, or a dry, shady position outside. 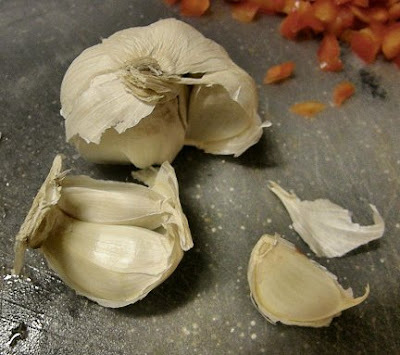 Be aware that sunlight can change the flavour of fresh garlic so a shaded area is paramount. Once the tops and roots have dried they can be cut off and stored. Keep your garlic is a cool, dark, and well ventilated position. Braiding and hanging garlic is a good way to keep them, but don’t hang it in the kitchen, where they will be in bright light. You can also store your garlic in a mesh bag or dish. Softneck varieties of garlic can be stored for 6 - 8 months. Check periodically to make sure that they are not going soft or sprouting. Hardneck varieties may dry out, sprout or go soft within 2-4 months.However, keeping hard-necks varieties as cool as possible but without freezing them cab help them to survive for up to 7 months without deteriorating. WHEN ARE ONIONS READY FOR HARVEST?